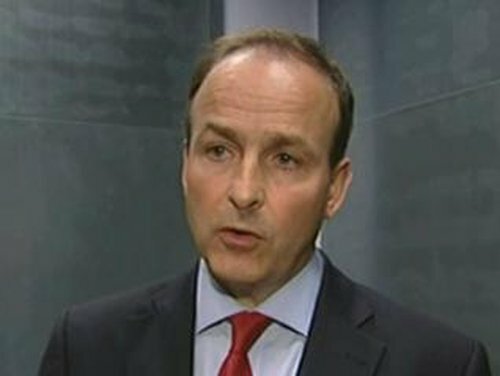 Minister for Foreign Affairs Micheál Martin has acknowledged that there is a significant challenge for the Yes side in the remaining weeks of the Lisbon referendum campaign. Mr Martin was reacting to a new opinion poll that showed a drop in support for the Treaty. The TNS mrbi poll in today's Irish Times shows the number of Yes voters at 46% - an eight point fall since the last survey in May. 29% say they will vote No, up one point, and there has been a big increase in the 'don't knows' - up to 25%. Speaking on RTÉ's Morning Ireland, Mr Martin said a vigorous campaign was needed to get the Yes message across, and accused the No campaign of a basic mistrust of Europe based on conspiracy theories. He said the Government had secured a number of legally binding guarantees about issues that concerned the electorate the last time. Sinn Féin's Caoimhghín Ó Caoláin responded by saying the Government and others had come back and 'tried to fool the Irish people that they have a new treaty or a better deal - they have no such thing'. He said his party is 'not conspiratorial in relation to the Lisbon Treaty'. 'We have an agreement that indicates that each of the member states will retain a commissioner but the agreement does not in fact guarantee that the arrangement will continue into perpetuity,' he said. 'It is very, very important that people get down to reading the fine print and understand exactly what is involved in the declarations, the protocol and the agreement in relation to the commissioner,’ he said. 'All we are looking at here are clarifications. 'Make no mistake about it you have endeavoured to pull the wool over the people's eyes by pretending this is a new treaty or a better treaty, it is neither', he told the Minister. 'It is the same treaty and on October the 2nd the Irish people should resolve to vote No', Deputy Ó Caoláin added. Meanwhile, Green Party leader John Gormley has acknowledged that the Lisbon Referendum could be lost unless the Yes side runs a positive and energetic campaign. Mr Gormley said they were not in any way complacent, and he had always been of the view that the outcome would be very close. He said the Yes side had been put on the 'back foot' in the last campaign answering the criticisms of the No campaign. This time, he said, the Yes side must run a positive and energetic campaign. He said they run a risk of losing the referendum if that is not done.